Here for radio hobbyists are a dozen handy-dandy 'kinks,' otherwise known as tricks, shortcuts, or clever ideas, that could prove useful while working in the lab at work or in your shop at home. One kink that might be worth trying calls for immersing an aluminum panel in a water-lye solution to achieve "a professional-looking finish." A satin look results. A Google search on etching aluminum turns up many other methods. Admittedly, most of these ideas would not have much application with today's ready-made radios, antennas, power supplies, etc., but there are still people who build custom equipment and/or repair circuits. The Editor will award a five dollar prize each month for the best short-wave kink submitted by our readers. 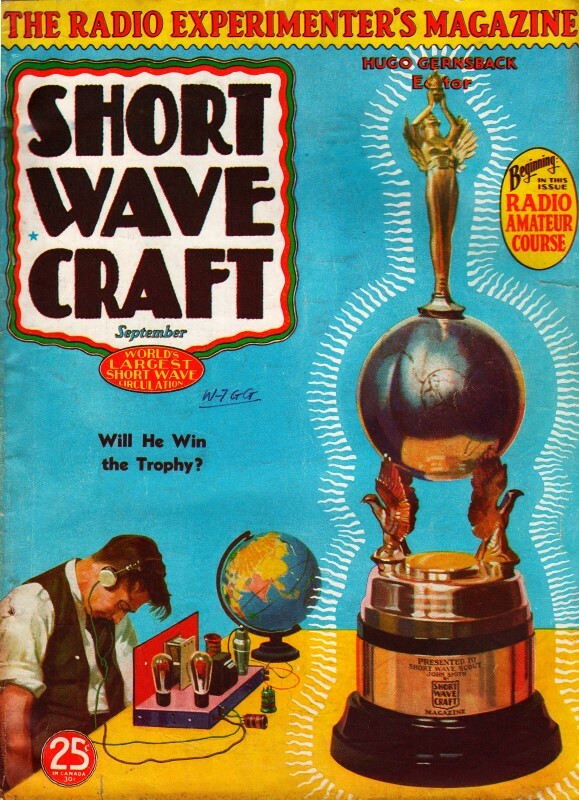 All other kinks accepted and published will be awarded eight months subscription to Short Wave Craft. Look over these "kinks" and they will give you some idea of what the editors are looking for. Send a typewritten or ink description, with sketch, of your favorite short-wave kink to the "Kink" Editor, Short Wave Craft. 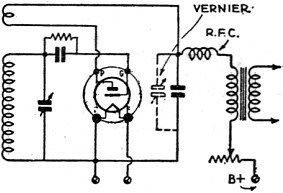 The short-wave experimenters who build simple receivers which require the use of an antenna-coupling condenser will find this kink especially valuable. 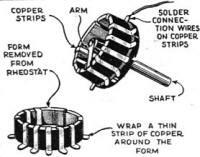 It consists of a small strip of bakelite or other insulating material on which is mounted four antenna-coupling condensers. 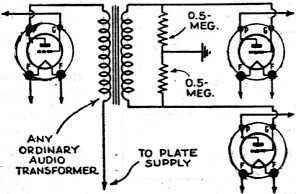 The drawing clearly shows how these plates should be made in order to be adjustable. 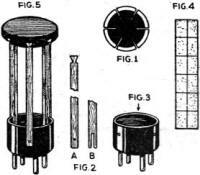 There is a separate condenser for each short-wave band and when putting it into operation each condenser should be adjusted for that particular band. Then when you change from one band to another it is only necessary to rotate the switch and bring the antenna condenser tor that band into use. Charles Dopita. The upright pieces may be made of wood, hard rubber or bakelite. 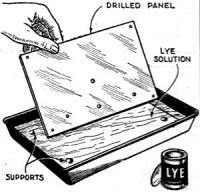 Cigar-box wood is easy to work and makes good coil forms. The lower end is slotted to fit over the tube base. (Fig. 2B. ) - Earl Ewens. 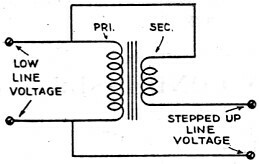 The A.C. line voltage. particularly in rural communities, sometimes drops to a low value during the evening hours. 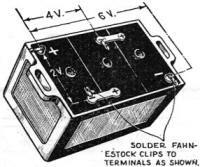 An easy and simple way to boost it to its proper value is to use a small transformer, with a secondary rating of between 5 and 15 volts, connected as shown. It may be necessary to reverse the leads to the secondary to get the proper relation between primary and secondary windings. - George Jelinek. It is now possible for the amateur set builder to put a professional-like finish on his aluminum panels. I have found a convenient method of using old lead-in insulators and old tube bases for a very compact and efficient coil form. 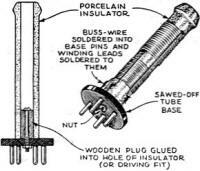 A bolt is cemented in the small end of the insulator with porcelain cement or regular household cement. Then a 1/8" hole is drilled through the center of the tube base for the bolt to pass through, and the tube base is bolted on with this arrangement. This coil works fairly well and is very compact. Also, the knob on the insulator acts as a good handle. - Bud Naratta. 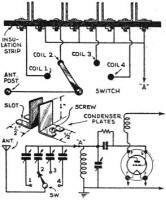 Set builders desiring to use push-pull in the output stage can save the cost of an "input" push-pull transformer by wiring it in accordance with the accompanying diagram. Any standard audio transformer can be used, and gives tone quality equal to that obtained by using a regular push-pull input transformer. - David Eastman. In order to make an inductance switch from an old rheostat, remove the element part and unwind the resistance wire. At even intervals wind a thin piece of copper strip around the form that the wire was wound on. Insert as many strips as you want contacts and reassemble rheostat. 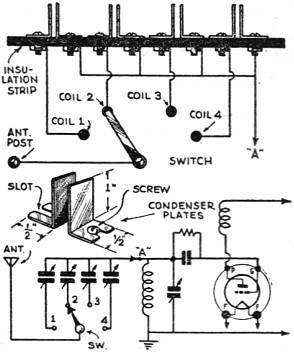 This switch can be used with tapped S-W coils. - Joe Naemara. For the DX-er who receives tips and notices of special broadcasts and new stations from various sources and wants a compact way of recording them, this little idea might help. 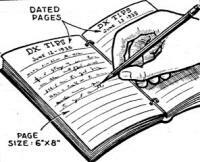 Get a diary (at least 6x8 inches, with ruled pages for each day in the year) and as you receive your tips enter them in the diary. Then when doing your DX-ing you have all the information in front of you, by simply turning up the required day. As an example you get a tip that a certain station is on Monday, Wednesday, and Saturday, and you wish to send them a report and you have not heard the same. Enter the station and frequency as well as time on the first. M. W. and S. to come and then when D'X-ing on that day, this information will be before you in compact form. This can also be used when you receive an advance notice of a special DX broadcast that you wish to hear. - James F. Maguire. In obtaining different filament on heater voltage for tubes from storage batteries, I solder Fahne-stock clips on each section of the battery, then I have 2 volts, 4 volts. and 6 volts. When reducing to a fraction of the next voltage, I use a variable resistor and a voltmeter to obtain the correct voltage. - Walter Rinkowski. 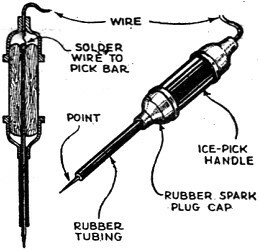 A very serviceable test-prod can he made from ice-picks by covering part of the pick with rubber tubing (see drawing) and by placing rubber spark-plug caps on each end of the wooden handle. The wire goes in through the top. - Barry Hassink. For smooth regeneration control on very weak signals the following kink is very effective: Connect a three-plate midget condenser across the main regeneration control condenser. With the plates of this vernier condenser unmeshed, tune in a signal and stop the set from oscillating with the main control. Now, gradually increase the capacity of the vernier condenser and you will find that the signal can be built up to a much greater extent than with the ordinary control. - W. Zelezng. 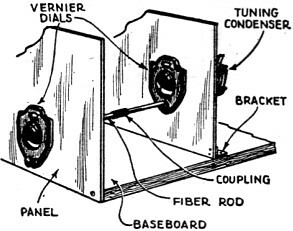 For the radio operators who are having trouble tuning in stations on their vernier dial, I present the following kink: Take an ordinary vernier dial and remove the knob. Mount your tuning condenser on a second metal panel about three inches from the front panel, next, mount a vernier dial with the knob removed on your second panel with a fiber insulating rod connecting the front vernier dial with the second one. Place the first knob on the front or your panel and place the second one in back on a supported metal panel and your "super-vernier" tuner is complete. - Otis R. Hill. Jr.